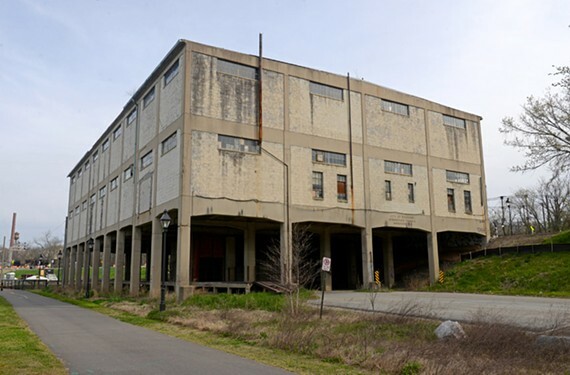 04/23/2018 11:57 AM by Jacob C.
RICHMOND, Va. — The fate of the Fulton neighborhood’s Intermediate Terminal building is expected to be decided Monday night. Richmond City Council is scheduled to vote at its Monday meeting on whether to allow the demolition of the building at 3101 E. Main St. to make way for a new restaurant and beer garden for Stone Brewing. The nearly 100-year-old building had been slated to be preserved and renovated for the venue, but Stone and the city last month called for a change in plans, saying engineering tests showed the long-vacant warehouse was too decrepit to be renovated as originally planned. Do you agree with Style Magazine’s take on the Terminal Warehouse? I am all for saving the structure since it is a unique design but, when the cost of stabilizing and restoring outweighs the value of the building is when you have to make these decisions. How much would it cost to build a replica, if the design is the focal point? If there is to be new construction smaller than the existing warehouse, why not on open land? Not all unique designs warrant saving. There is nothing especially notable about the design of this building. It’s a utilitarian box. Stop treating every old building like it’s Monticello simply because it’s old. Not all old buildings are historically or aesthetically valuable. This one isn’t. A developer removed all the decorative elements from a building to try to prevent the city from landmarking it (presumably he wanted to tear it down). He was subsequently informed that the layout and functional design of the building, and not it’s aesthetics or ornamentation, were the reason it was historic. The city landmarked the property anyway and he was stuck with a stripped/naked/bland looking building. Point is, there are plenty of reasons a building can be historic, and worthy of preservation, that have nothing to do with famous people living there, aesthetics, or what have you. @3 BAF. Yes, not every building needs to be saved unless it is in a historically protected neighborhood. Just that this building, on stilts you drive under, is a unique and rare remnant of a time when this area, where it sits, was a more active transportation hub for the city. When you are left with only one of something, you do try and protect it. @3 and @4. OK. But age aside what’s really historic about this? That it’s a warehouse? There are other warehouses nearby (many also blighted) to make us recall the past. Because we can drive under it? We drive under lots of things. Because of the interior layout? That was likely to be gutted in the transition to a restaurant. If it’s blighted—it is—and if it costs more to repair than is feasible—that’s the claim anyway—then there is nothing to be preserved. Blighted “historic” properties that have no prospect for rehabilitation may add to the historic atmosphere (if history is broken windows and graffiti), but not in a way that’s helpful. If Stone’s contention that rehabbing the building is not financially realistic then it should be abated and replaced by something that is actually used by people and provides positive economic value. When protecting history results in perpetuating blight you’re not doing history, the city’s tax base or neighboring properties that might be able to be restored if property values rise any favors. Again, not every property is worth preserving simply because it’s old. No one who built that warehouse expected it to outlast the pyramids so I’m not sure why we expect it to now given all the other alleged issues with the property. @BAF – there are plenty of preserved tobacco/cigarette related buildings further up in the bottom, but there isn’t much left in immediate area surrounding this building. The building speaks to the former intensity of use in what is now mostly vacant space. Also, the existing buildings are predominantly from other eras and associated with specific industries, whereas this building is actually representative of the fact that the area was once a busy/active/working waterfront. The other terminal buildings and associated dock structures are long gone, making this building the last or one of the last of something. Again, aesthetics and significant events should not be the sole measure of whether something is historic. I don’t know if preservation is merited or not, but it is certainly worthy of consideration. If there were numerous similar structures (specifically port structures) in the immediate area, this would probably be a much more clear cut decision due to the cost. If Stone hadn’t received a break from the city that specifically required preservation, it also wouldn’t be so difficult. Finally, times change and construction techniques, costs, and economic realities tomorrow may be more favorable. Perhaps the best solution is for Stone to build somewhere nearby and for this building to be mothballed. I’m always amazed when I see a developer tearing down a historic structure, however blighted, when there are numerous empty lots on the same block. I realize everything can’t always coordinate neatly, but as someone else has already said in a previous post, it would be cheaper to build new on vacant land and leave this building alone (provided, it needs to be stabilized and better maintained). That in turn might add enough value over time to tip the scales in favor of preservation. Can we please bring back a replica of the cement factory:)? Y’all, i like the building in question, because of memories and such…. and that the road drives through and under it, and that it reeks of industrial purpose….. But I can make new memories in whatever California Monster beer garden Stone wants to build. It’s a win win. @9. Yes. I am a real downer for wanting to get rid of a derelict concrete box that is decaying, blighted and that may not be economically feasible to rehabilitate. I am all for rehabbing structures when it’s feasible. But letting it sit there and rot when no one has the funds (or are willing to spend them) to do the work is insane when someone is willing to put the property to more economically-productive use while abating the eyesore. Right now, we need to increase the tax base in the city. Tonight the City raided the public art fund for street maintenance. Now, I personally don’t think we should be spending a penny on bad public art (think the monstrosity hanging under the highway across from Main Street Station) when the schools are collapsing and the roads are decrepit, but it is a sign that the city is in need of funds for basic operations. This property currently generates no revenue for the city and probably incurs costs at some level. That could turned around with a new structure that earns the city a few more dollars. We need the money a lot more than we need that rotting concrete box. This whole thing is starting to sound a bit fishy. The most recent times-dispatch article indicates that the problem isn’t the building, so much as the proposed renovations. Massive amounts of glass, necessitating a massive heating/cooling system which is too heavy to put on top of the building because of the stilts…. It kind of sounds like someone couldn’t do exactly what they wanted and is pitching a fit. So, what is the bottom line? What is happening with this building now? As far as an A/C unit, can’t it be on the ground rather than on the building roof? I am sure there are companies that make lighter weight units just because of various weight issues like this? Maybe an import manufacturer?